March is not only Women's History Month, it's also National Reading Month. So what better way to celebrate the two than with a gripping read about some remarkable women at a crucial time in America's history. 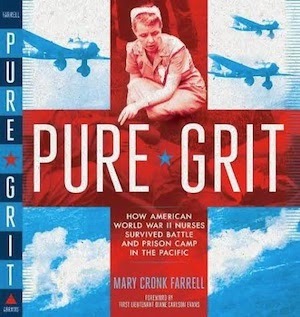 Mary Cronk Farrell's Pure Grit: How American World War II Nurses Survived Battle and Prison Camp in the Pacific (Abrams, February 2014) is designated for a third- to seventh-grade audience, but its appeal is much broader. I've talked about this title with parents and grownup friends as well as my own kids, and I simply cannot recommend this book enough. Not only does it detail the harrowing accounts of what these brave women went through, but it also looks at the frustrating treatment they endured upon return to the United States. Question: Pure Grit is incredibly well-researched. How long did this project take you from "ah-ha" moment to written manuscript. Can you talk about how you researched the manuscript and the people you connected with along the way? Q: This is a book that stayed with me long after I'd finished reading it. 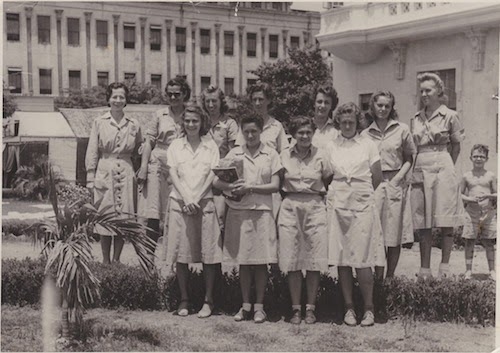 I called up my parents and told them to look for it, and I've asked friends about their knowledge of these American nurses' experiences. Your book seems appropriate for adults and young readers alike. What made you target a young audience? MCF: At this point in my career, I am focusing on writing for young people, so that is the main reason I targeted that audience for this book. But I always imagined adults would read it, too. There have been other books written for adults on the topic, but Pure Grit will reach a different segment of adult readers. I intentionally wrote the story to be a quick read for people who live busy lives, and included many photographs to make the story accessible to people who are used to getting information through images. Q: Fire in the Hole, Journey to the Top of the World, Daughters of the Desert. History and historical fiction seem to be your genres of choice. What draws you to this type of storytelling? MCF: I’ve always loved learning history, but I’m not sure why. As a child reader, historical fiction was my favorite genre. In my middle-school years I read an average of a book a day and most of them were historical fiction. I do know that I’m drawn to stories of people who’ve overcome adversity, because I’ve needed to learn how to do that in my own life. Books have always been an inspiration to me during the rough patches of life, and being able to write one like Pure Grit, which I know will inspire others, is an honor and privilege. 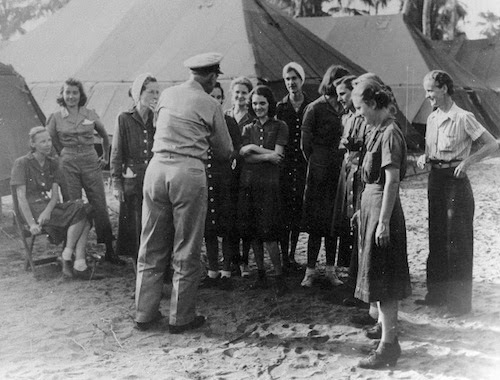 Navy Nurses in Leyte shows U.S. Navy Nurses liberated from Los Ban᷈os Internment Camp, Laguna de Bay, Philippine Islands, February 23, 1945. Q: What do you hope readers take away from your writing? What do you hope to achieve? MCF: Besides inspiring people through telling the story of these women’s resilience and courage, I hope readers will ask what we can learn from history. I hope people will be moved to have compassion for our Iraq and Afghanistan veterans. Not feel sorry for them, not ignore them because they volunteered for duty, but truly see their needs and be moved to listen to their pain and share their struggles. Q: What will we see next from you? MCF: My next book is a biography of Labor Leader Fannie Sellins, who was shot to death on the picket line in a 1919 Pennsylvania coal strike. 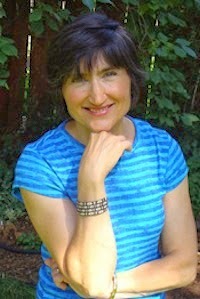 Kate Hannigan is a children's author and blogger. Visit her website KateHannigan.com and her blog, AuthorOf.blogspot.com, for more.